Mold is a common concern that parents contact us about. When moisture or water damage is not quickly and effectively fixed, mold can grow indoors. This can occur in homes, schools, and daycares. 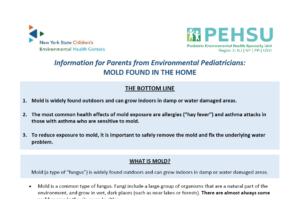 When mold appears in a child’s environment, parents want to know if the mold can affect their child’s health, and what next steps should be taken. 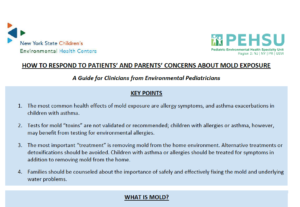 Our team of environmental pediatricians has created resources that address the most common questions we get from parents when mold is found in a home or school. Click on the links to the right to download. Mold (a type of “fungus”) is widely found outdoors and can grow indoors in damp or water damaged areas. The most common health effects of mold exposure are allergies (“hay fever”) and asthma attacks in those with asthma who are sensitive to mold. There have been scary stories in the news about “black mold”. Should I be worried if this was found in my home? The presence of mold, including stachybotrys or “black mold”, does not mean that your child will get sick. There is mold in my home. Should I test my home for mold levels? If mold or water damage is seen or smelled, that is enough evidence to take action to safely remove the mold and fix the underlying water problem. Should I get my child tested for mold? Tests for mold “toxins” are not recommended; however, children with allergies or asthma may benefit from environmental allergy testing. Is there a treatment for mold exposure? The most important “treatment” is removing the mold and fixing the underlying water problem. Alternative treatments or detoxifications should be avoided. Children with asthma or allergies should be treated for those conditions by their pediatrician. The key to preventing mold is controlling indoor humidity levels and fixing water leak problems in your home. What should I do if there is mold in my home? The key is safe, swift, and effective remediation paired with controlling indoor humidity levels and fixing water leak problems in your home. 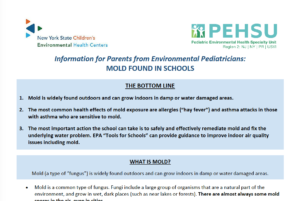 How can I work with my child’s school to prevent or address mold growth? The keys to preventing mold at schools is to control indoor humidity levels and fix water leak problems in a safe and effective way. The EPA’s Indoor Air Quality (IAQ) Tools for Schools program has guidelines for safe and effective prevention of mold and other hazards in schools. Share IAQ Tools for Schools resources with your school’s administration and encourage them to review the IAQ Tools for Schools Action Kit and implement its practices in your school. Or contact the NY State Department of Health program “Clean, Green, & Healthy Schools” program.